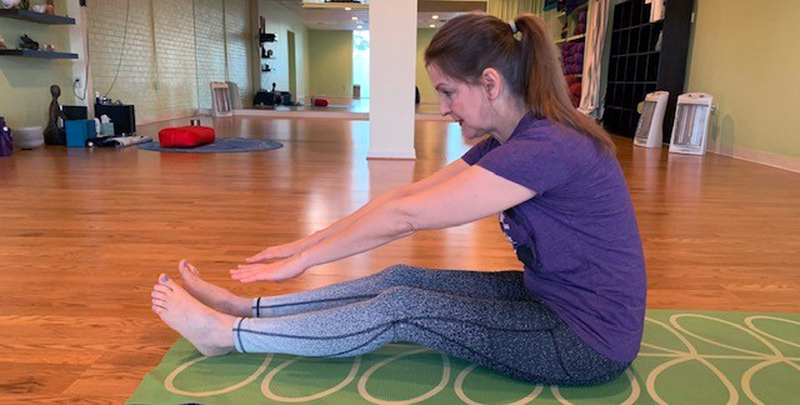 The following was written by guest blogger Susan Heffern-Shelton, winner of our Facebook drawing for a free year of Yoga. Susan will be blogging here about her yearlong journey with us. Like most people, but probably not you, I have a flaw or two. I’d make you a list, but I’m disorganized and lazy. It’s hard to decide which of my flaws is the worst, what with my horrible decision-making skills, but the one that really gets in my way is a crippling unwillingness to be bad. Karaoke? Nope. Not Adele. I’ll pass. Musical instruments? I quit guitar at the first mention of scales and modes. Scales and modes? Can’t I just be Carlos Santana by Thursday? Maybe sports? In high school, I quit the volleyball team at halftime of my first game. The coach agreed it was the right thing to do. Malcolm Gladwell says you need to dedicate 10,000 hours to achieve true mastery of a skill. I’ll give it 20 minutes. Then it’s back to my core competencies: eating and binging Justified. Despite being The World’s Most Inflexible Human, I did try yoga about 20 years ago. The teacher couldn’t have been more welcoming or warm. Which is why I knew it was with complete affection that she said, “Okay, everyone reeeach down and touch your toes. Unless you’re Susan, then touch your knees.” She wasn’t making fun of me. She was being, well, flexible. 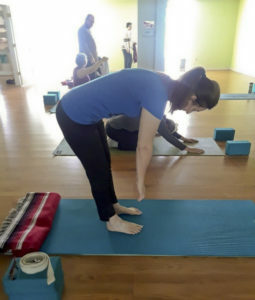 It was clear: yoga was not for me. I was bad, and worse, I was unwilling to suffer long enough to see if I might ever get good. As an elementary school teacher, I’m forever telling my self-doubting students, “Take the T off of can’t and say I can!” Looking at them, it’s easy to see how self-defeating an “I can’t” attitude is. Why is it so much harder to acknowledged that truth in myself? I’m still not entirely sure why I decided to enter Cassandra’s contest to win a free year of yoga. (Those poor decision-making skills again?) Maybe it was that her invitation was just so perfectly peppered with positivity: Free. Progress. Supportive. Caring. Free. My first class was a Sunday morning Beginner Plus, whatever that meant. I’d just have to push through my Beginner’s Aversion and do it. (I signed a contract, so there was no getting out of it.) I was going to be bad. I was going to be the worst. I was going to be Quasimodo in a roomful of Esmeraldas. But nobody ever really died of embarrassment, did they? When asked to silently dedicate my practice to some sort of goal, mine was simple: Don’t fall. Don’t fart. We all have to start somewhere. And this is where I started. If you’re Susan, touch your knees. She wasn’t kidding. Everything I expected going in turned out to be true: I was bad. I was the worst. They were graceful and I was a stove up old woman trying not to grunt or fart. Nobody laughed. Nobody judged. Nobody cared. It’s entirely possible nobody even noticed. Because those other people? They are actually there, get this, to focus on their own practice, not mine. Who knew! When I did make eye contact with someone, what I saw looked a lot like support. It looked a lot like caring. Just like Cassandra promised. A few times, a helpful soul even offered advice. “Try blocks in that pose. It really helps me.” It really helped me, too. There is a current of strength flowing through that room that lifts everyone in it. We all rise on the same tide. It doesn’t feel at all like competition. It feels like community. Now I get it. It’s not called a yoga practice because our goal is to be perfect. The practice is about evolution, gradual transformation. The starting point may be clear, but there is no fixed destination. As my wise yoga teacher friend Susan Toone says, “It’s not about touching your toes. It’s about what you learn on the way down.” So maybe it doesn’t even matter if I ever really get “good” at yoga. Maybe it’s enough just to continue to practice, to show up, to be part of the community. Maybe practice means striving, not arriving. Look out toes, I’m coming for you. If you’re interested in coming to the Sunday morning Beginner Plus class at The Floating Lotus, we’d love to have you! Please check our class schedule, as it changes daily.